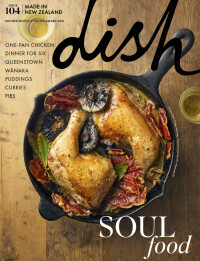 dish recipe creator and one-woman-wonder Sarah Tuck, has launched her debut cookbook. We discover why Coming Unstuck is single-handedly putting the flavour back into cooking solo. Cooking for one can be a lonely, lack-lustre experience. Anyone who goes it alone will tell you that it takes serious willpower to avoid the dreaded 'eggs on toast' rut. So, when Sarah Tuck decided it was time to release very own cookbook – a labour of love spawned after her 32-year marriage came to an abrupt end – it made perfect sense to dedicate this one to her fellow singles. Coming Unstuck is a beautiful manifestation of the rainbow that follows the rain. Leafing through Sarah's compilation of recipes for all occasions, personal extracts and self-styled food photography, you'll feel inspired and excited to cook for yourself again. "The chapters are slightly mad with ‘start the day right’, ‘sad arse dinners for one’, ‘share the love’, ‘the sweet stuff’ and more," Sarah writes on her blog, Stuck in the kitchen. "There are dinners that you can make just for yourself (easy, quick and tasty), family-style meals, dinner party fare that isn’t a mission to prepare as well as breakfasts, nibbly bits, fridge/cupboard stuff, desserts and baking." One of the chapters, the tongue-in-cheek-ily named “sad-arse dinners for one” boasts recipes like the Fix-me-up Soup, when you feel like you should be doing something healthy for yourself – green and full of flavour. There's the Evening-after-the-night-before Soup for when you need comfort without being too hard on the system and the scrambled eggs, salmon and edamame beans in an Asian dressing with brown rice that makes you feel like “I am just a health goddess”’, says Sarah, while the gruyere and bacon tarts are handy in the freezer for when you need a bit of decadence. To learn more about Sarah Tuck, or secure your copy of her debut cookbook Coming Unstuck, see here. Coming Unstuck is Sarah Tuck's love letter to herself. Here, you'll find recipe chapters like ‘start the day right’, ‘sad arse dinners for one’, ‘share the love’, ‘the sweet stuff’ and more. There are dinners that you can make just for yourself (easy, quick and tasty), family-style meals, dinner party fare that isn’t a mission to prepare as well as breakfasts, nibbly bits, fridge/cupboard stuff, desserts and baking. RRP $59.99.